I am very grateful to be here today. Special gratitude to Param Pujya Sri Srimad Vimalananda Maharaja who is a dear disciple of Sri Param Pujya Swami Shivanandji Maharaj, who my own guru Srila Prabhupada Bhaktivedanta Swami had very affectionate relationship with, Sri Vimalananda Swami Maharaj. In 1969, in San Francisco – Srila Prabhupada called San Francisco New Jagannath Puri because it is the first place in the Western world where the Rathayatra was celebrated – and in front of Lord Jagannath’s chariot Srila Prabhupada and Swami Vimalananda danced together. Vimalananda Maharaja: In 1969, in San Francisco, he had chariot festival, 3 chariots. They had to remove the overhead wires so that chariots could pass easily. Towards the end we all went and danced with Prabhupadji. There were more than 5000 people there, and they were all given prasad in very beautiful way. It was a wonderful sight to see. When Srila Prabhupada was a little boy, about eight years old, he used to look at the timetables of the Indian railway schedule to see what time the trains to Jagannath Puri would be from Calcutta where he lived. And when he was a little boy he got a little wagon and made a chariot for Jagannath and would have Ratha Yatras through the streets of Calcutta and dance and chant and give prasad. Then later he took that festival to the whole world. I am very grateful for your hospitality for welcoming us in this holy place. This Kali Yuga is an ocean of faults and people have such bad habits. What is religion is taken to be irreligion and what is irreligion is taken to be religion. But there is one benediction, that in this age of Kali by simply chanting and kirtan, the name of Krishna, one can attain the perfection of liberation. That the love for Krishna is within the heart of every being, and by associating with saintly people and by chanting Krishna’s name that love is awakened. 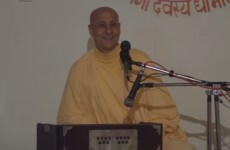 Swami Vimalanandji Maharaj was talking about how real wealth is in that love. I will briefly share one beautiful leela that has always very much moved my heart. 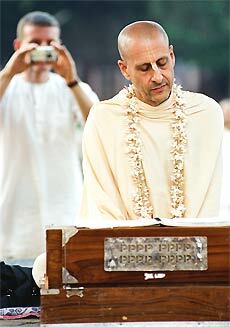 The name of the Lord, and the Lord is present and there are no hard and fast rules for chanting. So one day the Lord was having kirtan in the house of Srivas and Sri Gauranga at that time he was fulfilling the desires of all of his devotees. He saw one simple brahmachari named Sukhlambar. This Sukhlambar was very unknown, he was a beggar in the eyes of most of the people. He had a little thatched hut where he lived on the bank of mother Ganga, and every day with begging bowl he would go out to at least eight houses to beg. People would just give him a little, or the only thing they would give them is broken pieces of old rice because generally people don’t give beggars the best they have. Usually people don’t give beggars anything. But if they do give something, they give the cheapest thing they have. So he would have a little cloth bag and go house to house and collect these broken pieces of rice and the whole time he would be chanting the names of Lord Hari. He would be in the ecstasy of love for Lord Hari, but nobody knew. The common people thought he was just an ordinary beggar. He never advertised that he was a saintly person. He considered himself most ordinary. He was really trinad api sunicena. He had that humility. Quietly, silently, he would beg and would take him many hours till he got enough rice before he came with his bag to his little thatched hut chanting Krishna’s name. He would cook the rice and he would offer it to Krishna and then he would eat it. So after such a beautiful meeting, Sudama took leave and returned. And as he was walking back to his home, in his mind he was just remembering all the beautiful pastimes and conversations he just had with Lord Krishna. He was thinking, “Krishna, he’s the Supreme Personality of Godhead. He is the husband of the goddess of fortune, and who am I? I am just a very fallen insignificant friend of a Brahman, and yet with his own arms, he embraced me. He put me on his bed, he worshipped me, he was overwhelmed with gratitude and love.” But he was thinking of his wife, because she gave him that chipped rice and Krishna ate it. But he was supposed to ask Krishna for some wealth, but he didn’t as in his mind he was thinking, “How could I ask God for anything?” In the seventh canto, when Prahlad Maharaj was offered benediction by Narahari Narasimha Dev, he said, “My beloved Lord, if I ask anything in return for my devotion to you, then I’m not a devotee, I am not a bhakta, I am just doing business with you. My love, my service, my life, is only for your pleasure. I want nothing in return, except to love and serve you and always remember you.” That was the mood of Sudama, but when he got to the place where his house was supposed to be, he happened to see, there was a beautiful palace, with gardens and lakes and swans and wonderful trees and beautiful celestial people walking all around. He was thinking, “Where am I?” He was really astonished and then he saw this beautiful lady come out, in elegant gowns. And she came before him and he looked at her and then one of the ladies who was close by said, “This is your wife.” He recognized her, and she just looked down and together they walked into their palace. Neither one is a disqualification or a qualification; akinchan gocharam means ‘nothing is mine’. 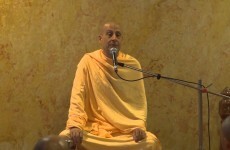 So Sri Chaitanya Mahaprabhu, when he was reminding Sukhlumbar brahmachari, “You are Sudama and now you have come again and it’s my greatest satisfaction to steal your rice.” Vrindavan Das Thakur explains that according to shastras, Pancharatriki Vidhi, there are certain rules and regulations and rituals in order to make an offering to Bhagavan. There are mantras and yantras and tantras and pujas and mudras, but Sukhlumbar, Sudama they didn’t do any mantras, they didn’t even offer it, but because of the simplicity and the humility of their devotion, even without an offering or an intention to offer, the Lord was so hungry that he stole it. In Vrindavan, Gopis, little Gopas would come and steal their butter, and they would, just for the opportunity to talk about these pasttimes, they would go to Yashoda Mai’s house to complain about Krishna. And they would say all the different things Krishna was doing to steal the butter – Makhanchor. And Yashoda Mai said, “Then I will keep Krishna at home.” They said, “No, no, no, no, don’t do that. The only reason we make butter is with the hope that Krishna will come and steal it. The only reason we live is with the hope and prayer that Krishna will come and steal our butter.” They were not offering to Krishna, but because it was made with love and devotion for Krishna’s pleasure, Krishna would come to taste it. These beautiful pastimes are there to teach the world, Krishna is bhakta vatsala. And if he accepts it, that’s the perfection of our lives. Chanting these beautiful names of the Lord Hari’s in kirtan is a sublime way of awakening that love and softening our hearts. Thank you very much.